44-squares chess variant design contest. Mini Slanted Escalator Chess is a variant of Slanted Escalator Chess. The difference is that two rows are missing from the board. All other rules are as in Slanted Escalator Chess, see the description of that game for details and more rules. Crabs always move exactly one square forwards, either diagonally left, straight ahead, or diagonally right. They capture like Pawns, to the left or right, and like Pawns can also make non-capturing moves to the left or right or straight ahead. Because Crabs only move 1 square at a time in Mini Slanted Escalator Chess, there is no en passant capture. Promotion in MSEC is the same as in SEC. Please also note that just as in Slanted Escalator Chess, and Ultra Slanted Escalator Chess it is possible to use the escalator squares to wind up with two Bishops on the same color. This is also legal in Mini Slanted Escalator Chess. Castling is the same as in the other games, it's rule is the same as in orthodox chess. The board is obviously cramped at first and will open up as pieces exchange off with each other. SEC was designed with a variant in which Knights could not jump across the barriers. This was not considered a rule of the 'standard game' but rather as an experimental variant which players could try out. Because of the extreme cramped conditions of MSEC, anything that gives pieces extra mobility is to the game's advantage, therefore that variant is not recommended. Game invented by David Short. Diagram by David Short. Text by Hans Bodlaender and David Short. Webpage made: May 13, 2004. Yes, you are right, Peter. I got confused. The ability to jump the barriers by the knights was a standard rule in SEC, and it's also a standard rule in MSEC. I must say that I am pleased to be able to enter this variant into the 44 squares contest. This design occurred to me long before this contest was ever announced. I feel a certain amount of satisfaction in knowing that there is now a mini variant of SLANTED ESCALATOR CHESS in MINI SLANTED ESCALATOR CHESS, just as there is also a large variant of SEC in ULTRA SLANTED ESCALATOR CHESS. All three games obviously share some similarities and readers will inevitably draw comparisons to each other and decide which is the best Escalator variant, the one with 44, 60, or 84 squares. I am sure that a lot of the entries in the 44 Spaces contest have designs where pieces are going to engage each other fairly quickly so I hope that readers will not penalize games for being cramped, knowing that it's almost inevitable for most entries. David, <p> That's what I needed! I've added your comments into the webpage. One thing though -- it was a variant of SEC in which Knights could <strong>not</strong> leap the barriers -- in the standard game they could. Peter, I am sorry I forgot to address the crab move when I submitted my entry. Because this is a scaled down version of the game, obviously, no, the crabs do not have the option of moving two squares on their first move. Crabs always move exactly one square forwards, either diagonally left, straight ahead, or diagonally right. They capture like pawns, to the left or right, and like pawns can also make non-capturing moves to the left or right or straight ahead. Because crabs only move 1 square at a time in MINI SLANTED ESCALATOR CHESS, their is no en passant. Please also note that just as in SLANTED ESCALATOR CHESS and ULTRA SLANTED ESCALATOR CHESS it is possible to use the escalator squares to wind up with 2 bishops on the same color. This is also legal to do in MINI SLANTED ESCALATOR CHESS. Castling is the same as in the other games, it's rule is the same as in orthodox chess. Promotion in MSEC is the same as in SEC. The board is obviously cramped at first and will open up as pieces exchange off with each other. SEC was designed with a variant in which knights could jump across the barriers. This was not considered a rule of the 'standard game' but rather as an experimental variant which players could try out. Because of the extreme cramped conditions of MSEC, anything that gives pieces extra mobility is to the game's advantage. Therefore, the ability of knights to jump the barriers in MSEC is a standard rule which applies to this game. Any other questions?? 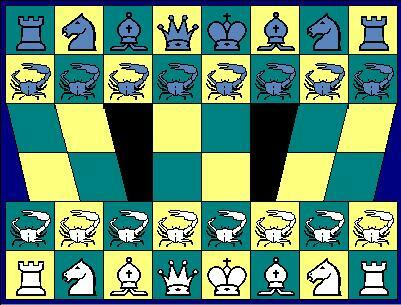 David, do Crabs really get an initial double-move in this game like they do in regular <u>Slanted Escalator Chess</u>? Author: Hans L. Bodlaender and David Short. Inventor: David Short.